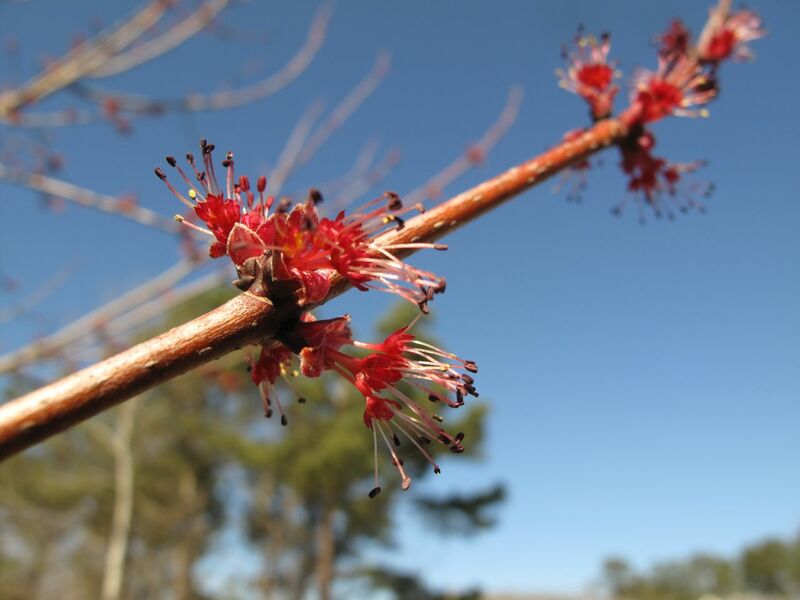 Today there is flowering on the Red Maple. Near the front sidewalk a lone hyacinth planted a decade ago is again working its way out into the open. February has been wet. There may be freezing rain tomorrow morning and another wet weekend is forecast, but today the sky is deeply blue and the sunshine is warm enough for face and heart. I am making progress mulching the garden, though the job has been slowed equally by the wetter, cooler weather and a healthier crop of weeds than I had expected. Though many birds keep watch as I work, only the Carolina Chickadees are brave enough to attempt a move toward the feeder while I am in the garden. From the windows I have been watching them too. Flocks of American Robins have been around for several weeks. They teamed up with Red-winged Blackbirds and Cedar Waxwings on Monday to strip the neighbors’ holly berries and make merriment. Eastern Bluebirds are beautiful but fairly pushy at the feeders. Northern Cardinals are lovely too but seem much more patient. The Mourning Doves make me smile. 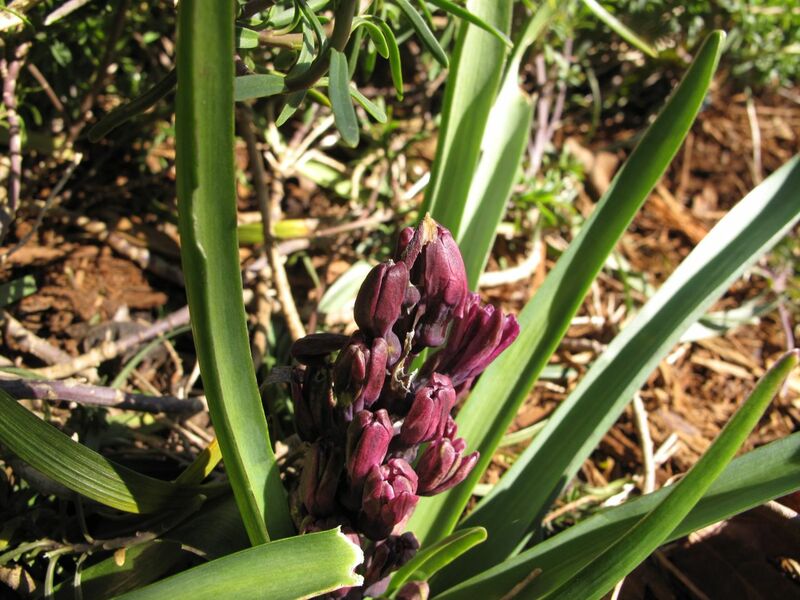 This entry was posted in garden and tagged acer rubrum, almanac, birds, hyacinth, winter garden on February 21, 2013 by pbmgarden. We have just recently planted an Acer rubrum in the communal gardens at our allotment site. We planted it to celebrate being named “Best Community Garden in Shropshire in 2012”. It was chosen mostly for the yellow of the autumn leaves. Now I look forward to seeing its flowers soon. Congratulations on your community’s award. The Acer rubrum is a fitting way to commemorate the achievement. Ours is a pretty tree but it is going to get too big for its site, unfortunately. I was curious after seeing your question. 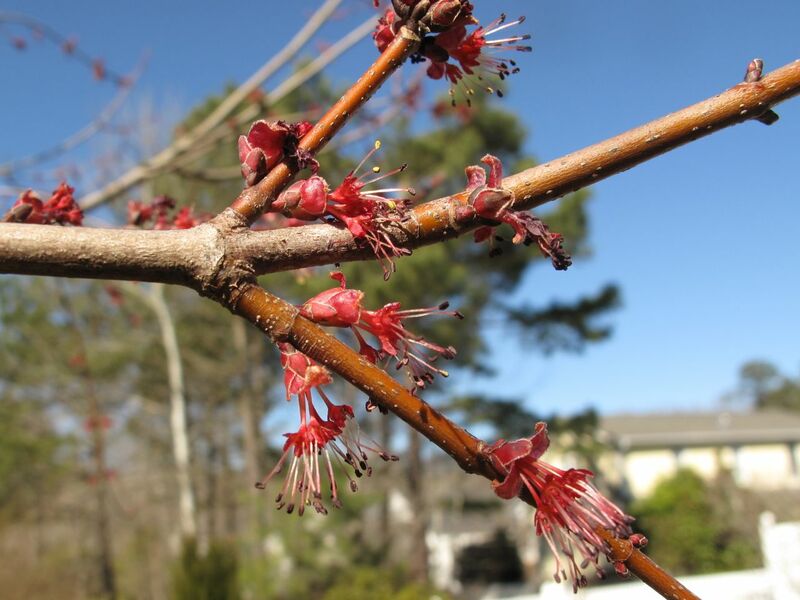 I found pictures of this tree just starting to flower on February 27, 2011 and February 9, 2012. This year seems in middle. It has been a much colder winter than last year. I’m bracing for the freezing rain tomorrow but it was pleasant working in the garden today. Hope you get a warm, lovely day to enjoy soon! Lovely to have trees that flower this early in the year, makes you think that spring isn’t far away! We are having very sunny days, but oh. so cold with a freezing wind coming straight from Russia! Hope you have it warmer soon. Your wind sounds fierce Pauline. Hard to enjoy being outside in that. Spring will a relief. Oh I hope we are only a couple weeks behind you with signs of spring. You’ve earned a beautiful and long spring Donna!